I developed Power Read-Alouds as a way to spiral important literacy skills in a short amount of time each day - while still capturing my students' love of picture books and being read to. Each Power Read-Aloud is meant to be used over the course of one week, in 15 minute increments each day. 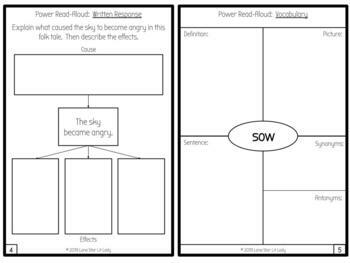 You read and revisit the text daily with students, while your students listen, think, talk, and write in response to the text. 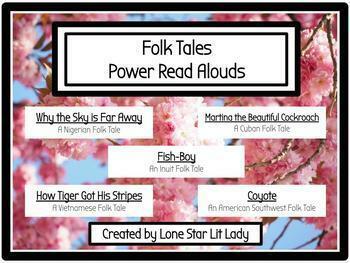 This set of Power Read-Alouds contains 5 age-appropriate, high-interest folk tales from around the world. 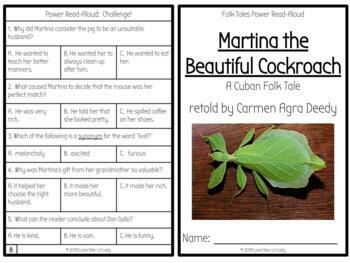 Power Read-Alouds are designed to be paper-saving booklets - each 8-page response booklet uses just 2 sheets of paper per student! I have also included an answer key for the Challenge Quiz questions, as well as a BINGO sheet for tracking student progress with each Power Read-Aloud. Please note - the picture books used for each Power Read-Aloud are not included in this download. The books needed are popular children's literature titles that are easily found at bookstores, school libraries, and public libraries. Please take a look at the preview before purchasing and enjoying!